There are friends, and there are the friends some friends endeavor to be. People who are so giving of themselves and their time that their happiest times are when they are giving to other people. 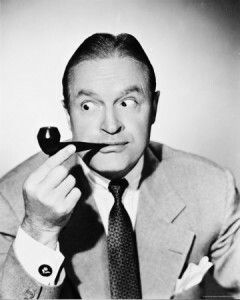 It doesn’t seem like it’s very plausible for everyone on the planet to have a million dollars, but that doesn’t mean we shouldn’t all feel like a million bucks from time to time, and nobody embodied that sentiment more than Bob Hope. I know gratitude has been expressed through film tributes, a freeway off-ramp, a star on the walk of fame, an airport, a stamp, but I’d like to share mine with the funny guy for being an inspiration to generations beyond anything he could have imagined in his efforts to entertain. When the world seems to laugh a little less and the “ring-a-ding” in your world seems more like “clink-a-clank” in an empty coin jar, remember there was a guy who’d go to the end of the world to make you smile, and he always brought a ton of Hope. Thanks for the memories, Bob.